This creamy Carrot Soup is made with fresh carrots, ginger, turmeric and a touch of coconut milk. 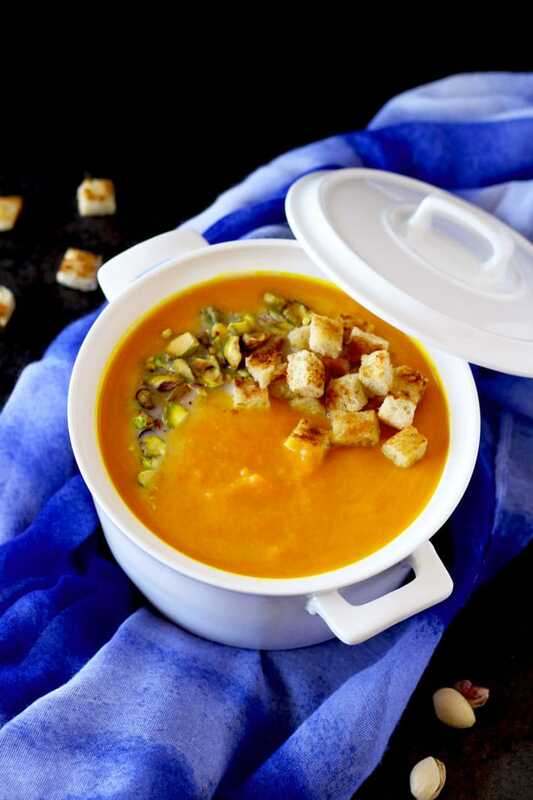 This delicious and easy to make carrot soup recipe is vegan, dairy free and gluten free. 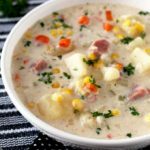 I am always looking for healthy soup recipes, especially during the cold winter months. 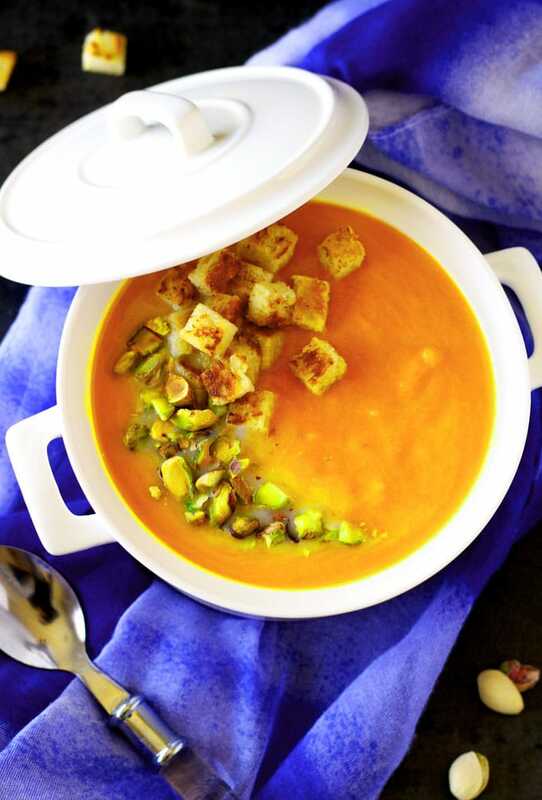 This bright carrot soup is like sunshine in a bowl! Nurturing, comforting and incredibly aromatic. 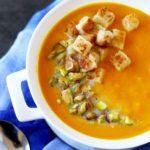 This carrot soup recipe, is a great way to use that bag of carrots you’ve had sitting in your refrigerator’s produce drawer for a while (or is that just me?). Although this carrot soup can be made with just carrots, the recipe calls for a sweet potato. If you don’t have any sweet potatoes at home or if you prefer to only use carrots, just add 2 or 3 more carrots to the recipe and you’ll be good! This creamy and velvety carrot soup is packed with vitamins and the immune boosting properties of ginger and turmeric. Both ginger and turmeric have been used for centuries in cooking and are also well known for their medicinal healing properties. In a pot saute chopped onions, celery, carrots and sweet potatoes (if using). Add the ginger and turmeric and saute for a few minutes. Add orange juice and broth. Freshly squeezed orange juice is best as it contains less sugar. Simmer until the carrots and sweet potatoes are tender. Using an immersion blender, blend the soup until creamy and smooth. If you don’t have an immersion blender, pour the soup into a blender, close the lid and hold the lid down with a kitchen towel before turning it on. Since the soup is hot, the steam will try to escape. You want to hold the lid down or you risk a lid explosion and a big mess. If using a regular blender, return the soup to the pot and add the coconut milk. Season to your taste with salt and pepper and simmer for about 5 minutes. 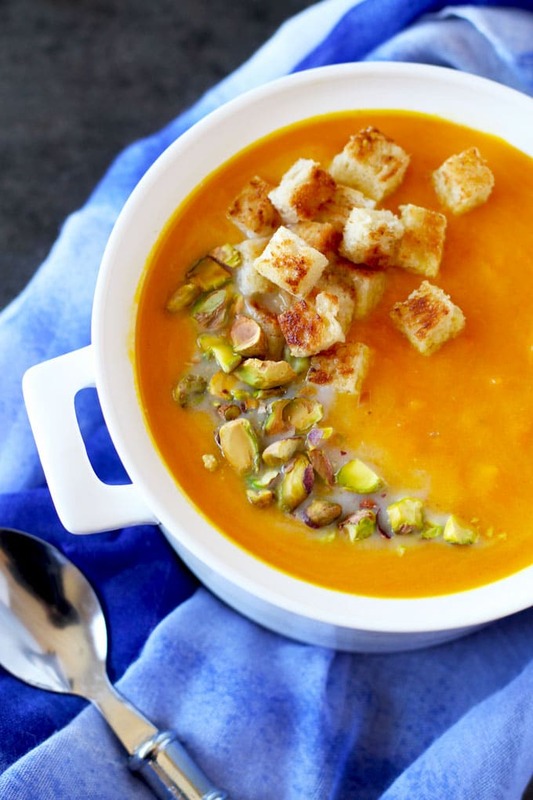 You can use fresh ginger or ground ginger for this carrot soup recipe. Both types have nutritional benefits. The same goes for the turmeric. I topped this delicious creamy soup with toasted pistachios, homemade croutons and a little bit of coconut milk. Other garnish options are toasted almonds, plain yogurt, sour cream and granola. WANT TO TRY THIS CARROT SOUP WITH GINGER AND TURMERIC? PIN IT TO YOUR SOUP, VEGETARIAN OR VEGAN BOARD!! In a soup pot or Dutch oven heat the oil over medium heat. Add the onion, celery, carrots and sweet potatoes and saute, stirring frequently for about 4 minutes. Add the ginger and turmeric and saute for another 3 minutes or until the onions are translucent and the vegetables look bright and glossy. Add the freshly squeezed orange juice and the broth. Stir and bring to a boil. Reduce the heat to low and cover the pan. Simmer until the vegetables are tender, about 20 - 25 minutes. Using an immersion blender, puree the soup until smooth. (or puree in batches in a blender or food processor). If using a regular blender or food processor, return the soup to the pot. Keep the soup on low heat and add the coconut milk. Season to taste with salt and ground black pepper. Simmer for 5 additional minutes. If you want to use carrots only, add 2 to 3 additional carrots and skip the sweet potato. You can keep the carrots with their peels if you prefer. If using a regular blender: Pour the soup into a blender, close the lid and hold the lid down with a kitchen towel before turning it on. Since the soup is hot, the steam will try to escape. This can cause the lid to fly off and create a hot mess! 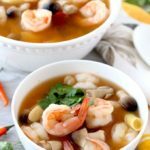 If the soup is too thick, you can add additional broth until you reach your desired consistency. This is certainly the best soup for winter as everywhere around me everyone seems to have caught some nasty bug! Love the freshness added by the orange juice! That’s one bowl of goodness:) like the ingredients and color of the soup! 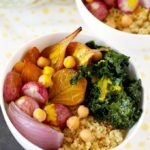 This sounds so good – I would probably add a few chilies in adobo because we like things spicy around here. Soup like this is such a good way to get in an extra serving of veggies!